Taqueria Chilangos, 2723 Roosevelt in Kenner, LA, occupies the same space as the late, lamented Madrid and the even later, more lamented (at least by me) Taqueros before that. 4 It’s a lively, friendly taqueria, bursting with with Mexican pop music, bare tables, and a neighborhood vibe, sharing a strip mall with a snowball stand, pool hall, and a Nicaraguan restaurant. In addition to tacos, tortas, sopes, and huaraches, Sunday’s specials included menudo and mole poblano. 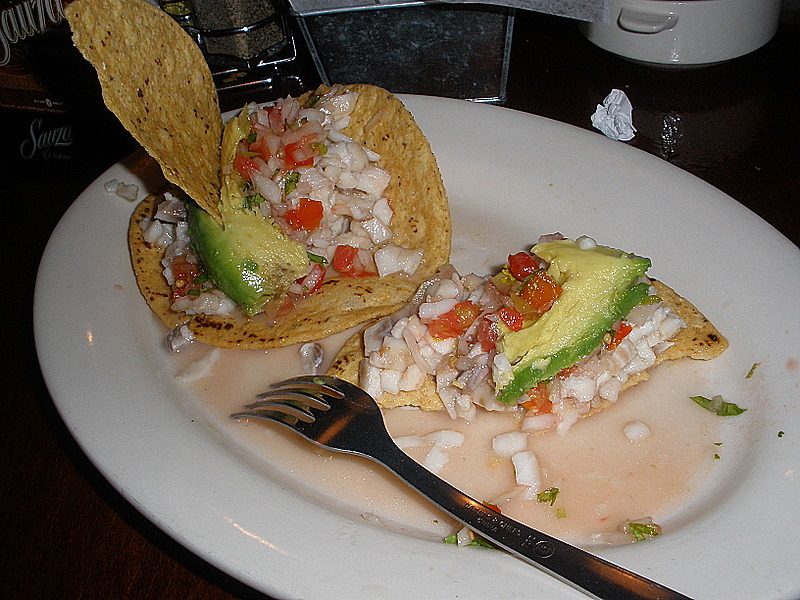 My ceviche tacos, overflowing with tilapia, red onions, tomatoes, and avocado, cost all of $6. Try the house-made tamarindo, real-sugar imported glass-bottle Coca Cola, horchata, or Jarritos sodas to wash it all down.